Nice to do a job close to home! 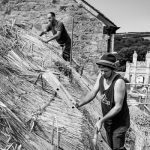 We’ve been thatching a roof in Penzance, Toby’s home town, and have had to battle frost as well as the usual hazards of ladders, and sharp tools. Properly cold up there some mornings! We were rethatching just the rear of the property, in wheat reed, and finishing with a flush-cut ridge, and a pheasant. Sometimes people ask us for creatures on their ridges and this owner requested a pheasant. Luckily no-one gets to see it close up, so it just has to be more-or-less pheasant-shaped! Big job this month, and well into April – thatching a listed roof on the old Angrouse Farm in Mullion with water reed. It’s always a challenge thatching a listed thatched roof, doing the property justice, and making sure that the new thatch is as good as the old, if not better. We finished it off with a pretty pattern-ridge, and the owners are very pleased with their crisp new look. We don’t often get asked to return to customers, because our work lasts for years and years. The exception is when people have more than one property that needs thatching, in which case we’re more than happy to go back. This month we’ve been working on the Function Bar at the Treguth Inn, near Newquay, following our work thatching the main pub and the summer house last year. Down near St Keverne, on the Lizard, we have rethatched a lovely cottage, with cute windows tucked in under the eaves. We thought it needed a little more care taking over the windows than had been done previously, so have added some shaping around the frames. It looks better, but also allows much more light into the rooms. The owner’s delighted. Thatching properly can save on your lighting bill – you heard it here first! Summer Shows are something we love to do – makes a change from being up ladders all the time, actually standing on the ground and talking to people! July is Stithians Show, and Padstow Vintage Rally. We were giving a demonstration of thatching at Stithians, and unexpectedly learnt basket-weaving at Padstow. Of course, we were thatching too, and letting people have a go, if they were curious. Sunshine is always better at these events, and we were lucky twice over, this year. Continuing our shows this month, at the Cornish Steam and Country Fair, at Stithians Showground. Admittedly, we’re not steam-driven, and tend to run on pasties instead, but it’s a great place for rural crafts. We were doing demonstrations, and talking to people about thatching across the three days of the fair. We’ll probably be there again in 2016 – keep an eye on this page for details. Shh – say it quietly, but we were in Devon, to work on a roof where only one side of the property needed re-thatching. We cleaned down the other side, and re-ridged with a wrap-over (much better than a comb-over) to weatherproof the ridge and tie the two sides of the roof together. We often get people stopping to watch us working – we’re rather used to it now. But we’ve never been stared at by camels before. Oh, and a peacock and some other birds with long necks and legs, and superior expressions. Everyone’s a critic!! Of course, we were down at the Camel Centre, at Roscuick, near Helston. 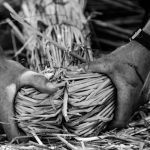 We were re-ridging a cob building on the farm, using wheat grown on the farm – this is very unusual for us, as we tend to use Austrian water reed, or else wheat grown elsewhere in the South West. We began 2016 by thatching a lovely cottage right next to Constantine Church. Very pretty ‘office’ but quite cold. The Church, with the cottage in the background, is ready for new postcard-pictures to be taken now! We’re delighted to have been accepted as members of the Thatch Advice Centre. (http://www.thatchadvicecentre.co.uk/). The Centre is a free resource for anyone who owns or maintains a thatched property, and also maintains a directory of specialists, so we’re very happy to be involved. Owning a thatched roof is just a little bit more complex than owning a regular roof, so this is a valuable resource for people looking for information about inspections, fire safety, repairs, or general advice. We completed a full re-thatch in combed wheat reed on a house on the Trelowarren Estate, out on the Lizard. We’re rather pleased with the flush-cut ridge, but had a fright for a moment when we discovered a hornets’ nest and wasps’ nest in the roof as we were stripping the old thatch. Thankfully, no-one was home! The friendly people at the National Trust asked us to replace the thatch on the little oak-framed summer house in the centre of the iconic maze at Glendurgan Gardens. All the materials had to be carried through the maze to get to the building, so if you’re ever lost in there, give us a call – we are experts now! We’ve been working with water reeds up in Exminster, Devon, but please forgive our short journey across the Tamar! Because we were able to live in the property, we completed this water reed roof in just ten days. Long days, but only ten of them! Our apprentice, Ed, has learned so much over these rather intense days that he’s making huge steps forward in his skills. Well done Ed! Hidden Valley Discovery Park, near Launceston, has a lovely little house in the grounds, which is becoming the centrepiece of a new Cottage Garden feature. They asked us to thatch it, which we did, using water reed, with a pattern-cut ridge. Being miniature, we only needed our short ladders, and you can see our work from all angles by taking the miniature train ride around the park. Big News in April as Toby is accepted into The Devon and Cornwall Master Thatchers Association. This is a body designed to ensure high standards of thatching, and known to be difficult to get into. For Toby, to be called a Master Thatcher is a big deal, and the achievement of a lifetime’s ambition. We had three roofs inspected, to ensure we meet the high standards of the Association, and they also checked over our business practices. We can now say with absolute certainty that we do a good job! We also worked on the Old Inn in Mullion, which has a truly unusual roof – only the front is thatched, with a scantel slate roof at the rear, and a ridge-tiled ridge. A good challenge here, marrying the two different materials into a watertight and harmonious roof. This was our first job for St Austell Brewery. Lets raise a pint to a long and happy working relationship! We’re currently thatching the Red Lion Pub, down at Mawnwn Smith. This is our second pub this year – could get to be a nice habit! http://redlioncornwall.com/ It’s right in the centre of the village, so a great advertisement for us, and a lesson in thatching for everyone passing by. Do stop to chat – we don’t mind! Here’s an update with the projects and events from the second half of 2016. We’ve had a great year – thanks to all our customers and supporters. Continuing from the last news update, we finished the Red Lion Pub in Mawnan Smith. This has been a great job – our biggest wheat job of the year, and a ready supply of cider. As with so many old buildings, the roof shapes are wonderfully contrary, with a tiny walkway between the two roofs, just right for keeping a ladder on! We then started a large water reed job in North Cornwall. We were asked to strip all the old thatch back to the bare timbers, to add a fire-proof membrane. Then we rebattened the roof before installing new thatch. Fire-proof membrane is a great product that will help protect your home in the unlikely event of a thatch fire, and help protect your thatch should there be a spark or small fire within your home. Having a fire-proof membrane will also reduce your insurance, so it’s worth bearing in mind if you’re planning a complete re-thatch. We can help you consider your options. 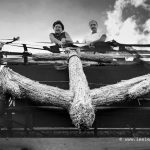 We got down to ground-level briefly in July, with stands at the Padstow Vintage Rally and Stithians Show. It’s nice to talk to people, and give a closer view of what we do. Ed, our apprentice, was happy answering questions from visitors, and we also let him cut his first ridge pattern. This is the decorative bit along the top of the roof, if you’ve not heard the phrase before, and there was no pressure on Ed, doing his first ridge pattern with an audience, none at all! We finished the North Cornwall water reed job, with lots of our favourite ridging, and sent Ed up higher than we normally get, to replace a cracked chimney pot. Our final bit of work in July was a fabulously over-the-top potting shed in Mullion, across a long, hot weekend. You can watch a time-lapse film of us at work here – https://youtu.be/d9VYC559i70. It doesn’t show the amazing barbeque which the owners provided for us, you had to be there for that… Cheers guys! We did a full water reed re-thatch of a house in St Anthony, situated on the mouth of the Helford River. It’s always a pleasure to work somewhere with views like this – we’re very lucky that our ‘office’ can turn up in different locations from one month to the next, and we get to enjoy the most picturesque parts of the South West. bad dye-job. The bright yellow will fade to match the rest over the next few months, and it’s important to remember that ridges wear out faster than the rest of the roof, as they take more punishment from the weather. Porches are also fun, as you can make progress really quickly, though they’re hard to take pictures of, as they’re totally covered in scaffolding while you’re working on them. We thatched a porch in Manaccan, using water reeds on an oak frame, and finishing off with a reed cat, peering over the edge at visitors. Quirky touches like this have been a feature of the thatchers’ art for many hundreds of yours, and we like to continue the tradition. Most of September was taken up with a charming holiday cottage in the centre of Ponsanooth. We had three weeks, between guests at the cottage, to do a complete thatch in water reed, so we were very much working to the clock. With a complete rethatch of a house in Porthoustock, near St Kevern keeping us busy in October, we decided to let Ed have his own section of roof to work on by himself. We’re very impressed with the finished results, and delighted to have an apprentice who is so keen, and learning what we can teach him so quickly. People always ask us if thatching is a dying art, and while it’s true that there are fewer thatched roofs than there used to be back in the day, and therefore fewer thatchers, it’s definitely not dying. We have a constant stream of work, with repairs, re-ridging and complete rethatches, so it’s clear that there will be work for thatchers for many decades to come. The weather has been kinder to us than some winters, so we’ve been taking advantage, doing repairs and smaller jobs. We finished off the year cutting a fancy ridge into a house looking out over the Helford River. It would be easy to just replace like for like, when rethatching a roof, but with a bit of thought and care, you can improve the property. We often add some new shaping to windows, to allow more light into the home, and give more character. Plus a fancy ridge makes more visual interest to the property. Did we mention that we like ridging? We are currently a few days into our first job of the year and will update as we progress. 2017 is already looking very busy for us and we look forward to letting you all know how we have got on.